With Detroit, Kathryn Bigelow has made another of the kind of heart-pounding, intensely realistic films that have made her one of the leading directors working today. 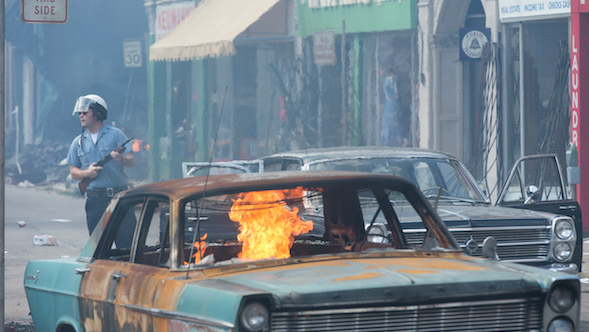 The film, which is already receiving enormous critical praise, tells the true story of the civil unrest and police action that tore Detroit apart in 1967. As with Bigelow’s The Hurt Locker and Zero Dark Thirty, the powerful, lifelike depiction of life-and-death events seem to unfold in real time and are presented in a way that feels like nothing was staged or prepared; the camera just happened to be at the right place at the right time. Stephen Nakamura, who did the color grade on Detroit (as well as The Hurt Locker and Zero Dark Thirty), is aware that this feeling in the viewer belies the significant amount of thought and creativity that goes into her films. Nakamura explained that Cinematographer Barry Ackroyd (The Big Short, Captain Phillips) took great care to light scenes of Detroit, most of which takes place within one hotel at night, without making them look lit – hiding small units in strategic areas throughout the set so the audience can follow what’s happening and catch the facial expression or body language that’s key to the scene without ever making things look theatrical.